Bhirrana or Birhana is a small village located in Fatehabad District, in the Indian state of Haryana. Bhirrana is the oldest Indus Valley Civilization site, dating back to 7570-6200 BCE. 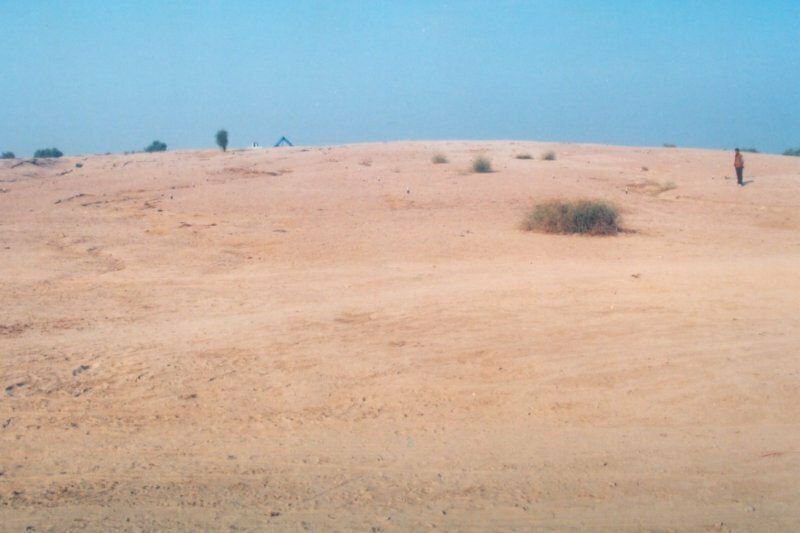 The mound measures 190m north-south and 240m east-west and rises to a height of 5.50 m from the surrounding area of flat alluvial sottar plain. The site is situated about 220 km to the northwest of New Delhi on the New Delhi-Fazilka national high way and about 14 km northeast of the district headquarters on the Bhuna road in the Fatehabad district. The site is one of the many sites seen along the channels of the ancient Saraswati riverine systems, now represented by the seasonal Ghaggar River which flows in modern Haryana from Nahan to Sirsa. The Excavation Branch-I, Nagpur of the Archaeological Survey of India excavated this site for three field seasons during 2003-04, 2004–05 and 2005-06. The excavation has revealed the remains of the Harappan culture right from its nascent stage, i.e. Hakra Wares Culture (antedating the Known Early Harappan Culture in the subcontinent, also known as Kalibangan-I to a full-fledged Mature Harappan city. Prior to the excavation of Bhirrana, no Hakra Wares culture, predating the Early Harappan had been exposed in any Indian site. For the first time, the remains of this culture have been exposed at Bhirrana. This culture is characterised by structures in the form of subterranean dwelling pits, cut into the natural soil. The walls and floor of these pits were plastered with the yellowish alluvium of the Saraswati valley. The artefacts of this period comprised a copper bangle, a copper arrow head, bangles of terracotta, beads of carnelian, lapislazuli and steatite, bone point, stone saddle and quern. The pottery repertoire is very rich and the diagnostic wares of this period included Mud Applique Wares, Incised (Deep and Light), Tan/Chocolate Slipped Wares, Brown-on-Buff Wares, Bichrome Wares (Paintings on the exterior with black and white pigments), Black-on-Red Ware and plain red wares. The entire site was occupied during this period. The settlement was an open air one with no fortification. The houses were built of mud bricks of buff colour in the ratio of 3:2:1.The pottery of this period shows all the six fabrics of Kalibangan - I along with many of the Hakra Wares of the earlier period. The artifacts of this period include a seal of quarter-foil shape made of shell, arrowheads, bangles and rings of copper, beads of carnelian, jasper, lapis lazuli, steatite, shell and terracotta, pendents, bull figurines, rattles, wheels, gamesmen, and marbles of terracotta, bangles of terracotta and faience, bone objects, sling balls, marbles and pounders of sandstone. This period is marked by transformation in the city lay-out. The entire settlement was encompassed within a fortification wall. The twin units of the town planning; Citadel and Lower Town came into vogue. The mud brick structures were aligned with a slight deviation from the true north. The streets, lanes and by-lanes were oriented in similar fashion. The pottery assemblage shows a mixed bag of Early Harappan and Mature Harappan forms. 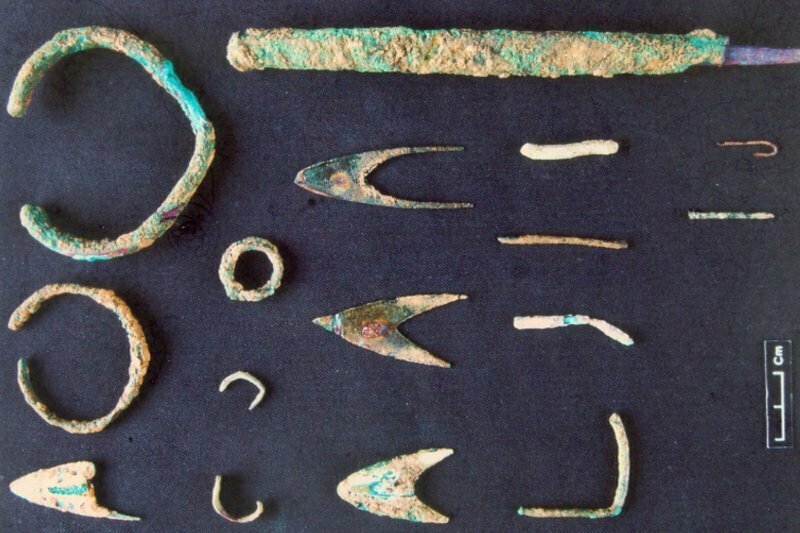 The artifacts of the period included beads of semi-precious stones (including two caches of beads kept in two miniature pots), bangles of copper, shell, terracotta and faience; fishhook, chisel, arrowhead of copper; terracotta animal figurines and a host of miscellaneous artifacts. The last period of occupation at the site belongs to the Mature Harappan period with all the characteristic features of a well-developed Harappan city. The important artifacts of the period consisted of Seals of steatite, bangles of cop-per, terracotta, faience and shell, inscribed celts of copper, bone objects, terracotta spoked wheels, animal fig-urines of terracotta, beads of lapis lazuli, carnelian, agate, faience, steatite, terracotta and stone objects. A replica of the famous “Dancing Girl” from Mohenjodaro is found engraved on a potsherd in the form of graffiti. The massive fortification wall  of the town was made of mudbricks. The houses were made of mud bricks (sun-baked bricks). Wide linear roads can be seen separating the houses. A circular structure of baked earth is probably “tandoor"- a community kitchen still seen in rural India. Presence of the baked bricks is seen used in the main drain provided on the width of the northern arm of the fortification wall to flush out the waste water from the houses. Dancing girl graffiti Pottery graffiti at Bhirrana show “mermaid” type deities and dancing girls; the latter have a posture so similar to Mohenjodaro’s bronze “dancing girls” that the archaeologist L.S. Rao stated that “it appears that the craftsman of Bhirrana had first-hand knowledge of the former.” These deities or dancing girls may represent apsaras, or water nymphs, associated with water rites once widespread in the Indus Valley civilisation. Other findings Terracotta wheels with painted spokes are also a significant finding. People used to live in shallow mud plastered pit dwellings and pits were also used for industrial activity or sacrifices. Multi roomed houses were exposed at this site, one house with ten rooms and another with three rooms; another house had kitchen, court yards, chullah i.e., chulha, cooking stoves] in kitchen and beside chullah, charred grains were also found. All phases of Indus Valley Civilisation are represented in this site.